Phoenix Gölköy, trunk blackened and burnt during the fire of 1993. Phoenix theophrastii was described by the Swiss botanist Dr Werner Greuter in 1967, from the grove at Val in Crete. Greuter noted that the 'Cretan Date Palm' had been known since Classical times, when it was recorded in the writings of Theophrastus (Greek botanist-philosopher) so he named the new palm in his honour. It is the only European palm other than Chamaerops humilis. Natural stands of Phoenix theophrastii were discovered in Turkey in 1982, in the south-west of the country in the Datca Peninsula not far from the famous tourist town of Marmaris. Three years later a second locality was recorded at Kumluca-Karaz in Finike Bay about 250km away from the Datca site. Recently a further new Phoenix population has been reported by Prof. Boydak and Kew's Sasha Barrow at the Village of Gölköy, north of Bodrum not far from Datca as the crow flies. The Phoenix population has been known to the inhabitants of Gölköy for hundreds of years. In 1989 two Professors of landscape architecture visited the Gölköy palm population and considered it to be representative of P. theophrastii. 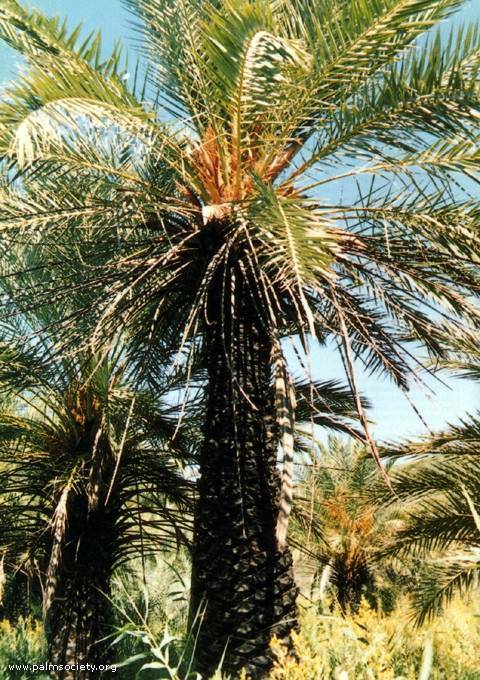 In the early summer of 1990 Boydak made the first of several trips to Gölköy and he immediately noticed several distinct differences between the Gölköy palms and P. theophrastii and P. dactylifera. Since then samples of the palm have been sent to the Royal Botanic Garden, Edinburgh (1990), and Royal Botanic Gardens, Kew (1993). In the spring of 1994 Boydak from the University of Istanbul and Sasha Barrow from Kew made a trip to the three natural stands of Turkey's palms and collected further herbarium materials. An excellent article about the Gölköy palm was written by the two above mentioned authors, and appeared in Principes (July 1995). Gölköy palm grove is not far away from the town of Bodrum and easily reached by road. The area is under pressure from the expansion of the village with new summer housing and tourist facilities. Gölköy, meaning in Turkish "Lake Village" is named after the lake that borders the palm grove and village. A drainage trench surrounding the whole area is already being built. Before the construction of the trench, the buggy ground was completely flooded for several months of the year. Since the construction of the drainage trench certain parts of the palm grove are inundated with water for only 2-3 months annually. Fortunately there are a lot of springs that feed the lake, so hopefully it is not possible for the drainage ditch to dry out the bog completely. In June 1993 a fire spread to a part of the Gölköy palm grove. Although many palms suffered from burnt and blackened stumps they recovered very well, even seeming to be more robust with new suckers. I think this is similar to P. theophrastii. Now necessary steps are taken to protect the area. P. theophrastii is distinguished from P. dactylifera by its upright fruit clusters and small inedible fruits, also it has smaller, shorter and sharper leaves. The height of the Gölköy palms is not more than 8m, on the other hand P. theophrastii at Datca and Finike reach up to 17m. Gölköy fruit stalks are 60-200cm long, whereas those of P. theophrastii rarely exceed 30cm, and they hold fruit marginally larger. At the moment it is not clear if the Gölköy palm is a variety of P. theophrastii or is a new species. Further and more complex studies will reveal the answer. I have been involved with palms for almost three years now, after joining the European Palm Society, and I have three year old plants of Phoenix theophrastii and 2 year old plants of Phoenix Gölköy in my nursery. Kycegiz, Bodrum and Datca are all in Mugla Province which is famous for its wild orchids and other classical Mediterranean flora. We have a very big farm here, by the Dalaman International Airport. I hope in a few years' time Mugla Province will have the first 'Temperate Palmetum' in Turkey, at my garden. At the moment I am trying to prepare about 2000m2 for the palmetum, but it is very costly as the ground water table is too high and there is a magnesium alkalinity problem in the soil and in the underground water. So far almost 50 kinds of palms and cycads are growing in the nursery, some Washingtonias from seed (two and a half years old) are already more than 2 meters in height. The arboretum is going to be established by our "Special Environmental Protection Department" with the financial help of the German Government, who are building the roads and bridges and the irrigation scheme. I hope one of the forthcoming European Palm Society meetings can be held in Mugla and I will be pleased to assist the participants.